A natural substance found in dairy products appears to protect against diabetes, say researchers. Trans-palmitoleic acid is present in milk, cheese, yoghurt and butter but cannot be made by the body. A study of over 3,700 people found higher levels of trans-palmitoleic acid was linked with a reduced risk of type 2 diabetes. People with the highest levels cut their risk by 60%, Annals of Internal Medicine reports. Lead author of the research, Dr Dariush Mozaffarian, said: "The magnitude of this association is striking. "This represents an almost three-fold difference in risk of developing diabetes among individuals with the highest blood levels of this fatty acid." Deepa Khatri, clinical advisor at Diabetes UK, said: "People should not take the findings of this research as a reason to exceed the recommended portion amounts of dairy food in order to prevent their risk of developing Type 2 diabetes. 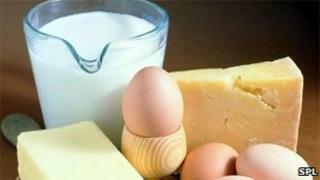 "Milk and dairy foods can be high in fat, which if eaten in excess can contribute to weight gain. So it's advisable to choose lower-fat dairy foods instead. Experts say more research is needed to see whether these trans-palmitoleic acids can play a useful role in preventing Type 2 diabetes. In the meantime, they recommend that all people, with or without diabetes, should have a healthy balanced diet, low in fat, salt and sugar with plenty of fruit and vegetables. It is not recommended for people to increase their intake of any one food type in order to prevent their risk of developing Type 2 diabetes. The latest work tracked the health of the study participants over a 20-year period. The results showed that higher levels of trans-palmitoleic acid were associated with healthier levels of blood cholesterol, insulin levels and insulin sensitivity, even when other factors were taken into account. Experts estimate type 2 diabetes affects more than 2.3m people in the UK. Up to half a million more Britons also have the condition but do not yet know it. Why give milk to children?